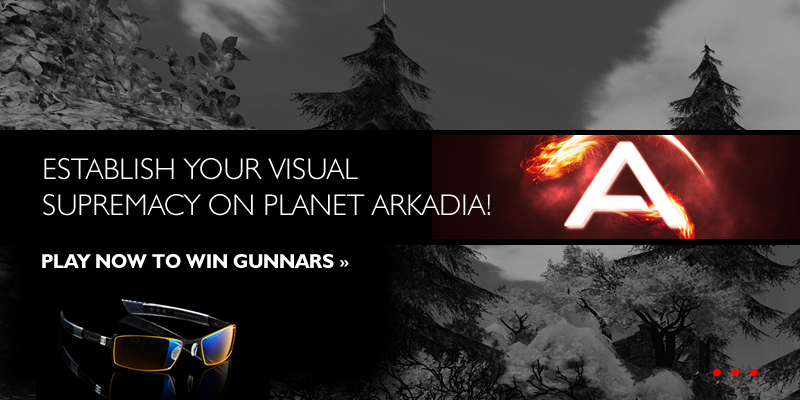 Arkadia Studios today announced a partnership with GUNNAR Optiks to create Virtual Gaming Eyewear. Arkadia Studios and GUNNAR Optiks have joined forces to bring a real world piece of gaming equipment to life in the virtual world. A 3D version of GUNNAR’s Vayper Onyx will be available to colonists on Planet Arkadia from today, after the release of Planet Arkadia Update 2013.1.1. Additionally, colonists will be able to purchase a certificate for the real life version directly from the Arkoin Broker. GUNNARs are high tech computer eyewear, designed to protect, enhance and optimise your vision. They use a number of specific technologies to reduce the stress on your eyes, including FRACTYL lens geometry, DIAMIX lens material, IONIK lens tints and iFi lens coatings. Part of the recently announced Arkadia Sunrise era is about promoting Planet Arkadia globally. The GUNNAR promotion represents an opportunity to do so. As such, we have created www.planetkarkadia.com/gunnar which we encourage colonists to take a look at. Random hunting loots across the planet will drop a limited number of virtual GUNNARs glasses over approximately the next three months, in both Male and Female versions. A limited number of certificates will be available to purchase from the Arkoin Broker with today’s patch (Planet Arkadia Update 2013.1.1). Each certificate needs to be validated with Cyrus | Arkadia either here at Planet Arkadia Forum or in-game, contacting the avatar “Cyrus Arkadia Community Manager”. The specific real life item is the onyx coloured model detailed here. You spend most of your waking hours glued to your computer screen, smart phone, tablet, or TV monitor. As the hours go by, you subject your eyes to the harsh, high intensity blue light and glare from your screen. This constant viewing of digital screens can create visual stress, eye fatigue, dry eyes, irritation, and even headaches — leading to an obvious conclusion. Staring at a computer for long hours takes its toll on your eyes. Add the standard 2-4+ hours a day gaming and your reality is complete and total visual burnout. GUNNAR Optiks Advanced Gaming Eyewear is a technical eyewear solution that helps protect, enhance, and optimize your vision. Whether you are gaming for long hours or working on the computer, GUNNAR eyewear helps minimize eye fatigue and visual stress while improving contrast, comfort, and focus. GUNNAR Advanced Gaming Eyewear also creates a more comfortable and rich visual experience for the avid gamer, improving visual efficiency, endurance, and recovery.